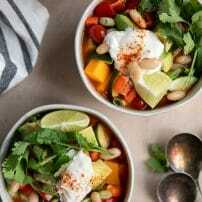 This Vegetarian Butternut Squash Chili is loaded with healthy vegetables like sweet bell pepper, tomatoes, and zucchini, chunks of sweet and delicious butternut squash, and three different kinds of beans. 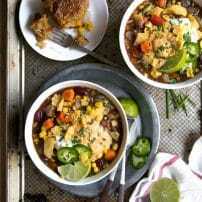 Enjoy this Butternut Squash Chili topped with cheese, sour cream, and cilantro and serve with your favorite cornbread. 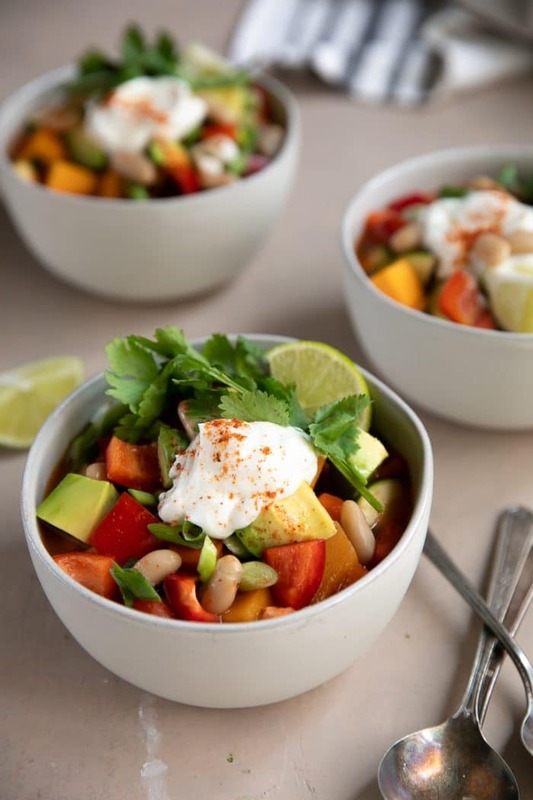 Everyone will love warming up this winter with a big bowl of this healthy butternut squash chili. 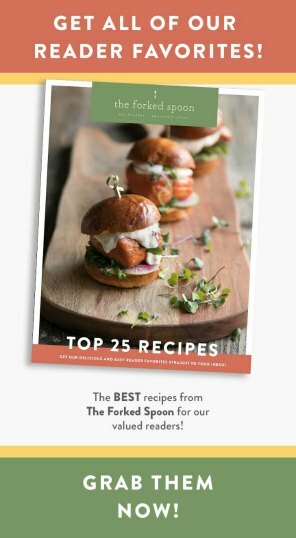 Learn all about my favorite fall squash, including how to cook butternut squash here. 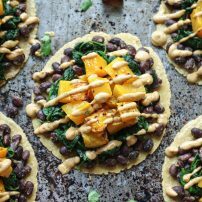 Somewhat sweet, super healthy, and always packed with flavor, butternut squash is one of those quintessential fall vegetables that seems to taste great with everything. Enjoy this nutrient-packed squash roasted, tossed in your favorite salad, or pureed into soup. New to Butternut squash? Start HERE. Much like the acorn squash and spaghetti squash, it’s important to look for a butternut squash that is heavy for its size. It doesn’t need to be the biggest one, but one that is solid and heavy for its size is a must. You’ll often find me standing at the market picking up all the butternut squash seeing how their weight compares. Cook the onions and garlic. Add 1-2 tablespoon of olive oil to a large stockpot or heavy-bottomed Dutch oven over medium-high heat. Add the onions to the pot and sauté for 3-4 minutes, stirring often. Stir in the minced garlic and stir to combine. Sauté for 1-2 minutes, stirring continuously. Add the vegetables. Add the diced bell pepper, cherry tomatoes, butternut squash, and canned tomatoes (with teh liquid) to the pot and stir well to combine. Cook the vegetables with the onion for approximately 5 minutes, stirring often. Spice it up. Add the chopped chipotle chilies, ancho, chili powder, ground cumin, salt, and pepper. Continue to cook, stirring constantly, for 1-2 minutes. Add some bulk. 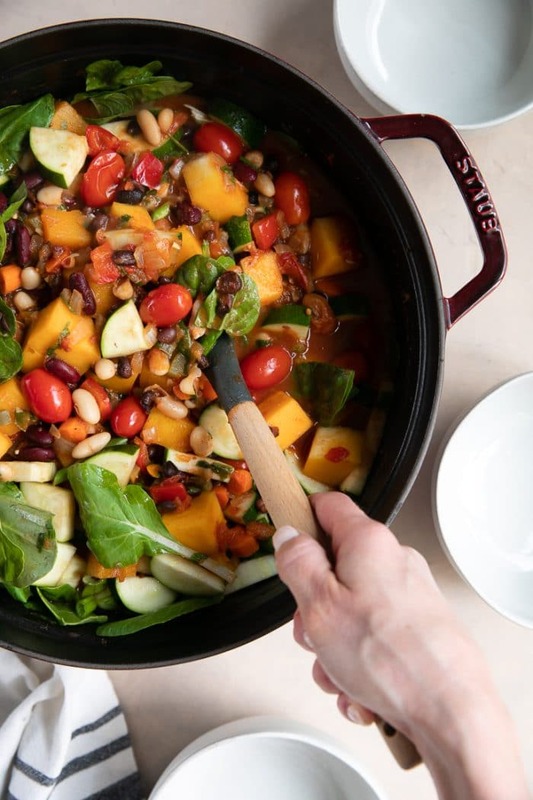 Transfer the zucchini, black beans, kidney beans, and water to the pot, mixing well to combine. Bring to a boil, cover, and reduce heat to low. Simmer for at least 20 minutes, or until the squash is fully cooked and fork tender. Add the greens at the end. Uncover and remove the pot from heat. Stir in the baby spinach or chopped kale, if desired. Season with additional salt and pepper, if needed. Serve and garnish. Serve garnished with your favorite toppings such as avocado, shredded cheese, sour cream, or green onion. More traditional chili recipes are hearty, heavy, and made with some kind of ground beef or ground turkey. 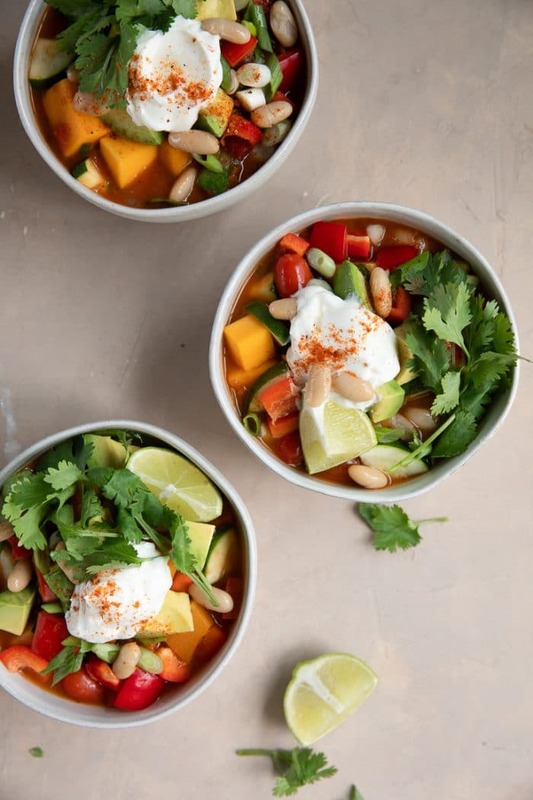 I love cozying up to big bowls of chili like this throughout the cool winter months, but sometimes a girl needs something a little healthier. 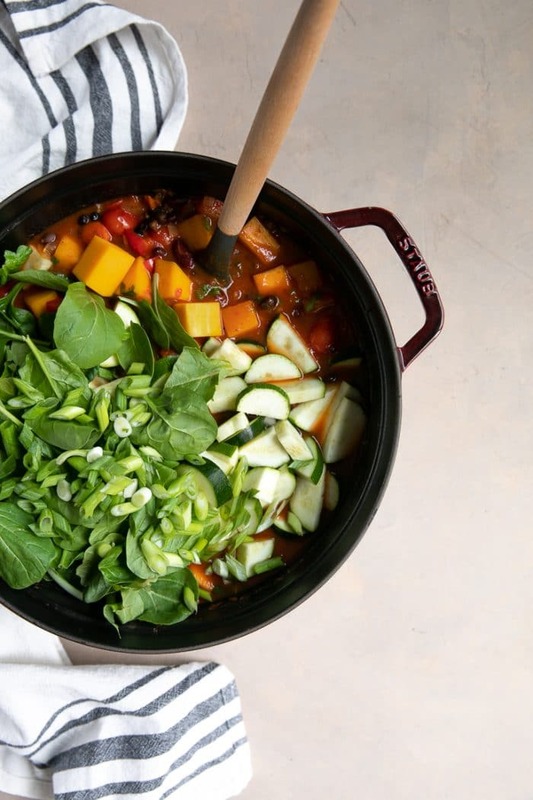 This butternut squash chili couldn’t be healthier. Here’s why. It’s packed full of vegetables like bell pepper, zucchini, spinach, and onion. Not to mention all those big beautiful cubes of soft, buttery, butternut squash. No meat? no problem! 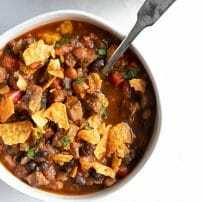 There are so many delicious beans in this pot of chili that will fill you right up! And keep you feeling full! In other words, beans equal protein…and fiber. Of course, you can always add meat to this recipe if you’d like. Or, prepare a bit of ground beef or ground turkey on the side as an option for any meat-loving people in your house. 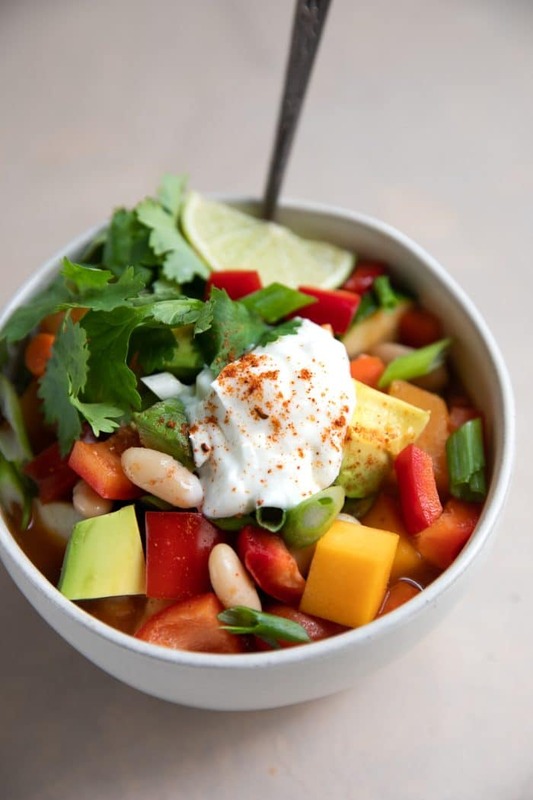 If you try cooking this Butternut Squash Chili, please leave me a comment and let me know! I always love to hear your thoughts. DON’T FORGET TO PIN AND SHARE THIS BUTTERNUT SQUASH CHILI TO MAKE FOR AN EASY AND FLAVORFUL DINNER OR HOLIDAY SIDE DISH THE WHOLE FAMILY WILL LOVE. 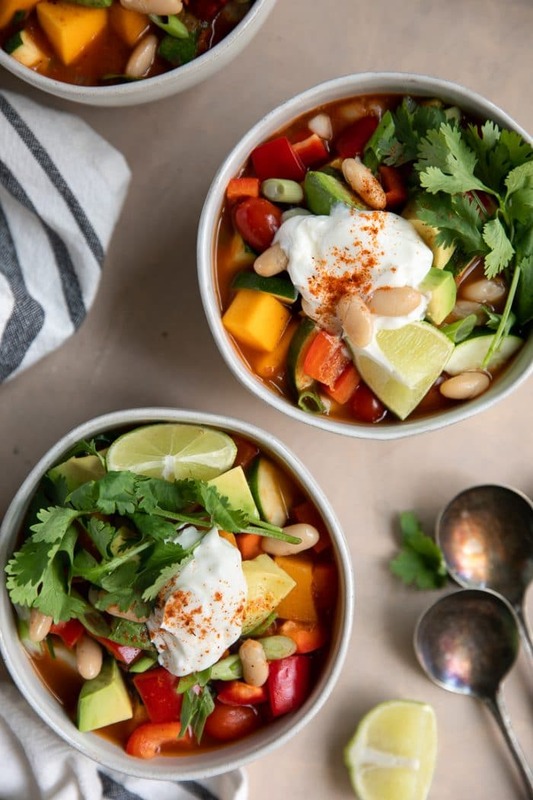 This Vegetarian Butternut Squash Chili is loaded with healthy vegetables like sweet bell pepper, tomatoes, and zucchini, chunks of sweet and delicious butternut squash, and three different kinds of beans. In a large heavy-bottomed Dutch oven or stockpot (I used my 8-quart Dutch oven with plenty of room) warm 1-2 tablespoons of oil over medium heat. Add the chopped onions and sauté for 2-3 minutes or until soft and translucent. Add the minced garlic to the onion and mix. Cook for an additional 1-2 minutes, stirring continuously. Add the diced bell pepper, cherry tomatoes, and butternut squash. 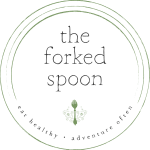 Mix well with a wooden spoon or spatula to combine. Cook the vegetables for approximately 5 minutes, stirring often. Add the diced tomatoes (with the liquid), chopped chipotle chilies, ancho, chili powder, ground cumin, salt, and pepper. Continue to cook, stirring constantly, for a minute or so. Finally, add the zucchini, black beans, kidney beans, and water to the pot, mixing well to combine. Bring to a boil, cover, and reduce heat to low. Simmer for at least 20 minutes, or until the squash is fully cooked and fork tender. Remove from heat and stir in the baby spinach or chopped kale, if desired. Season with additional salt and pepper, to taste. Serve garnished with your favorite toppings such as avocado, shredded cheese, sour cream, or green onion. Enjoy!